Justin Laffoon's engine based on the 1994 prototype design. I've known Justin Laffoon and his dad for a year or so now because of our mutual interest in old air-cooled Volkwagens. 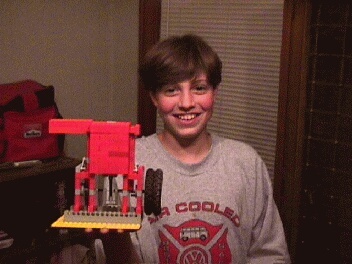 In June of 1999, I took my LEGO engine to Omaha, NE and showed Justin, his dad, and a few other curious onlookers my 1994 prototype design. Justin proceeded to go home and design this engine that very evening! Last I had heard, when air was put to it, it blew up. :-( Currently, he has taken his LEGO with him while he visits his mother in Iowa so I'm sure he going to refine the engine while he's there. I'll post more updates from Justin as they filter in. I've rebuilt my prototype so many times I've lost track, so a few engine blow-ups are part of these creations (and it's dimentedly fun to watch!) Thanks for the submission Justin!